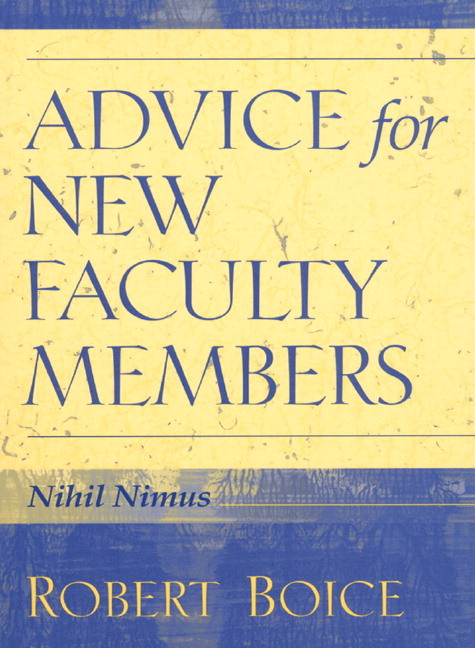 Introduction: Why New Professors Need Timely Advice. Moderate Negative Thinking and Strong Emotions. Summary and Extension of the Nihil Nimus Approach to Teaching. Rationale for a Mindful Approach to Writing. A Summary of Chapter 2 and its Mindful Ways of Writing. 3.Socialize and Serve with Compassion. Introduction: Why Compassion Is Ultimately Important. Learn about Academic Culture, Early, Patiently. Let Others Do Some of Your Work. Combine Self-Service with Service for Others. General Summary: Catalog Sujmary of Nihil Nimus Rules. Appendix: Readings by the Numbers.